You know what's one of the most devastating feelings to experience? When you're on the way to completing a goal, chugging along and going strong, and suddenly – BAM. You lose motivation. It could be for a number of reasons – stress, time constraints, lack of interest. Being properly motivated is something we all struggle with from time to time. Goals can get old quickly. It's a part of life. Here's the thing, though. Motivation is something you have to work towards. You don't just wake up feeling motivated; you have to take steps to get there. 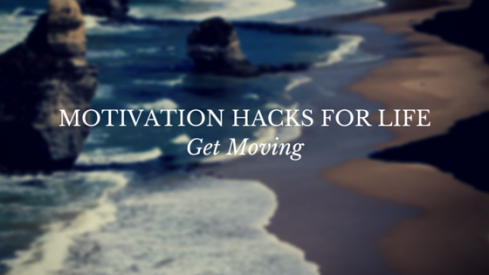 When we lose motivation, it can become very disorienting to get back on track. So, will you ever feel motivated again? Yes – give it time, and while you're at it, try these eight hacks to help you find your footing. Many people, including famous poets, athletes and celebrities, have been where you are. They were kind enough to share their experiences by leaving behind some words of wisdom. Place them next to your computer, on your desk, around your bed – anywhere you'll need that extra push. If you're one of those people that has a hard time following through on their word, perhaps writing it down formally will work. Create a contract for your commitment – list your goals, how you plan to get there and include penalties for when you lose. For example, if you don't complete your goal of losing a certain amount of weight, your penalty could be donating $25 to a charity. Sound crazy? Take a look at this success story, and maybe you'll think otherwise! Goals can be turned into quantitative data. When you present your goal in this way, you can see your progress in a different light. First, have some goals in mind – maybe from that commitment contract – and plan them out over a daily or weekly basis. Then, put a check for every completed goal and an X for every incomplete goal. Numbers don't lie, and when your goals become data, you'll be full of pride each time you check one off. When we start something, we can be really enthusiastic about it at first. Then we quickly realize that goals, especially long-term ones, can get overwhelming. It's hard to maintain motivation for that long. As Forbes points out, "When we set large goals, we are requiring ourselves to also have an equally large belief system to support it." Here's the solution: Break down your goals into smaller ones. This way, it won't seem like you're facing such a monumental task. Maybe you could use that progress chart to organize your smaller goals. Your mini-goals should have rewards attached, because let's face it – rewards are 75 percent of the reason why we do things. Knowing there’s more on the way can motivate you to keep going. Nothing like a little classical conditioning. So indulge in a little chocolate ice cream, or take that vacation you've been planning. Rewards, no matter how small, always feel great. Even if a goal is large or small, there's always those times where we want to throw in the towel. From the moment you start your goal, know that these urges will come. The more you're prepared for these urges, however, the more likely you'll overcome them. Planning for failure makes you smart, and provides you with opportunities to start again should you fail. Doubt is an unavoidable part of achieving a goal – the question is whether or not you're ready enough to get past these feelings. Your network is one of the best places to look for encouragement. If you're keen on accomplishing a goal, why not let those close to you know about it? They'll be there for you through it all, cheering for you on the sidelines and making sure you stay on track. Another way to go about this is creating a little friendly competition. Team up with others so you won't feel like you're facing a goal alone. Not only does this create a support system, but it creates just enough of a competitive atmosphere to make you want to come out in first place. Believe it or not, when you're in a bad mood, you're more likely to procrastinate. When we have access to all these distractions that seem like more fun than our goal, we cave in easily. That leads to feeling sad when we fail or don't achieve our goals. In order to combat all this, happiness is key. It increases productivity and it sets us up for success. Plus, as an added bonus, people usually enjoy a nice friendly attitude instead of a negative Nancy. Motivation is something you have to work at in order for it to be successful. If you follow these tips, you're already one step ahead to becoming an optimistic, motivated individual. You'll find that with a fresh motivated attitude, life will start looking sunny and beautiful real soon.